Should Christians Seek to Be Magistrates? It is not often questioned now whether a Christian should be a magistrate, hold a political office, or work for the government in some capacity. In fact, in recent years, the question in the United States has rather been whether it is right to vote for someone who is not a Christian. But this was not always the case. In past centuries, the question of whether Christians should be magistrates was one that many took seriously. In this article, I want to show how I came to this question, give a little historical background to the question, and point out some Scriptures that I believe answer it very clearly. Q. 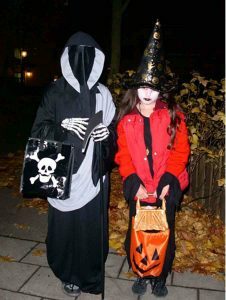 Should Christians participate in Halloween celebrations? the Lord” in the Bible concerning Halloween. But I do believe that it is possible to come to a conclusion about it that is in harmony with Scripture. When considering whether we should participate, we should ask ourselves some questions. 1. What are the origins of the day? 2. What do people think of the day today? 3. What Scriptures apply to the situation? Let’s try to answer these questions. Peace on Earth, or a Sword? December 2016: One Scripture we’re likely to hear at this time of year is Luke 2:13-14: “Suddenly, there was with the angel a multitude of the heavenly army praising God, and saying, ‘Glory to God in the highest, on earth peace, good will toward men. '” The angels were announcing the birth of Jesus Christ to the shepherds, and what they said about peace on earth is true. Yet, what, exactly did they say? Years later, Jesus Himself said, “Don’t think that I came to send peace on the earth. I didn’t come to send peace, but a sword” (Matthew 10:34). This would certainly seem to be the opposite of the angels’ good news. Is what Jesus said a contradiction of the angels’ message? If not, how can both of these things be true? Q. Don’t you think that your article, “Do you think Bible-believing Christians should keep Christmas?” is double-talk? I think that attending a Christmas dinner or having anything else to do with Christmas is observing the day and is an unacceptable compromise with pagan practices. A. I want to point out that I was not promoting the observance of Christmas in any religious way. Under the New Covenant, there are no days, whether commanded under the Old Covenant or practiced by pagans, that Christians must keep. Day keeping is one of the “weak and beggarly elements” and “rudiments of the world” (Galatians 4 and Colossians 2). Paul clearly taught against such observations. But he also said that even an idol is nothing, his point being that he knew he could even eat meat that had been offered to an idol (see 1 Corinthians 8). In other words, it’s not the thing but what is in our mind. Yet he would not do it if it offended his brother. 14 September 2010: As you no doubt know, Terry Jones, pastor of the Dove World Outreach Center in Gainesville, Florida, called off his stated plan to burn Korans this past Saturday. I am thankful for this because it avoided an action that, I believe, would have turned Muslims (and, perhaps, others) away from the Gospel. It would also have been a biblically inexcusable, un-Christian action. (The article below gives further details about why I believe this.) This incident has brought to the forefront certain disturbing trends in American society and questions about the direction in which we are heading. Perhaps I will mention some of these in a future article. 9 September 2010: This is an update to the article below concerning pastor Terry Jones and his Dove World Outreach Center's plans to burn copies of the Koran. I want to clarify two points: 1) Even if Terry Jones and Dove World burn Korans, this action would not justify Muslims or anyone else committing any acts of violence in response. One foolish action does not justify another. It should be perfectly obvious to any Muslims following the news that Terry Jones and Dove World do not represent Christianity or the majority of the American people. Unfortunately, there are many people who are just itching for violence and looking for an excuse like this. 2) It may be true that burning Korans is a form of free speech that is protected by the Constitution of the United States. However, Paul said, "All things are lawful for me, but all things are not expedient: all things are lawful for me, but all things edify not" (1 Corinthians 10:23). That is why my article does not concentrate on Constitutional rights, but on what, for a Christian, is expedient and loving and gracious and what would further the Gospel rather than hinder it. Certainly, we should not be afraid to evangelize Muslims, but burning the Koran is not the way to go about it. If you try clicking on the links in the article below to go to the doveworld.org website, you will notice that they are not working. When I wrote the article , the links were working. But at midnight last night, doveworld.org's web hosting company, Rackspace, pulled the plug on doveworld.org. According to Dan Goodgame, a spokesman for Rackspace, "We had a complaint that this site was promoting anti-Islamic hate speech, we investigated and agreed that it breached our acceptable use policy." Terry Jones told CNN that this was an attack on his freedom of speech. The bottom line is that because of this, the links to doveworld.org in the article won't work (the other links should still work), but I still hope you will read the article. Here is a link to an article on The Register that gives a little more information about Rackspace's action (http://www.theregister.co.uk/2010/09/09/rackspace_dove/). By the way, this same article says that Dove World Outreach Center has lost half of its 50 members because of Jones's plans to burn the Koran. I have not yet been able to confirm this. A small church in Florida has made international headlines by saying its members will burn several hundred copies of the Koran on September 11, 2010. (Koran is also spelled Qur’an, Quran, Qur’ān, Coran, and al-Qur’ān, but I will use Koran in this article.) The church’s Facebook page says they will do this “in remembrance of the fallen victims of 9/11 and to stand against the evil of Islam. Islam is of the devil!” The Dove World Outreach Center is pastored by Terry Jones, author of a book called Islam Is of the Devil. According to the World Christian Encyclopedia: A Comparative Survey of Churches and Religions in the Modern World, 19 major religions share the earth (not always peacefully, of course). A closer look shows these further subdivided into 270 large religious groups with many smaller ones. This source identifies 34,000 separate Christian groups. Other experts might differ on the exact numbers, but the point is that most people would say that this planet sports a great many religions. But is that really true? I mean, if you were to distill these religions down to their basic essence, how many would you really wind up with? Or, to put it another way, if you can sift 19 religions into 270 by examining their finer points, can you go in the reverse direction and aggregate them into a smaller number? What if I were to tell you that, when it comes right down to it, the people of this world can be divided into only two religions? That’s right, I’m making the claim that when we use the most basic component of a belief system as our criteria, we will find that only two religions exist on the earth and that all of the other divisions arise merely because of details. Sound crazy? Let’s see.